The Global Volcanism Program has no activity reports for Usulután. The Global Volcanism Program has no Weekly Reports available for Usulután. The Global Volcanism Program has no Bulletin Reports available for Usulután. Usulután volcano anchors the SE end of a cluster of basaltic to basaltic-andesite stratovolcanoes between San Vicente and San Miguel volcanoes. The flanks of the forested volcano are dissected, but youthful lava flows are present on its southern flanks. The younger summit rocks of Usulután and the Cerro Nanzal pyroclastic cone on the lower SE flank were mapped as Holocene (Weber and Wiesemann, 1978). A broad 1.3-km-wide crater is breached to the E from the summit to its lower flank. The Global Volcanism Program is not aware of any Holocene eruptions from Usulután. 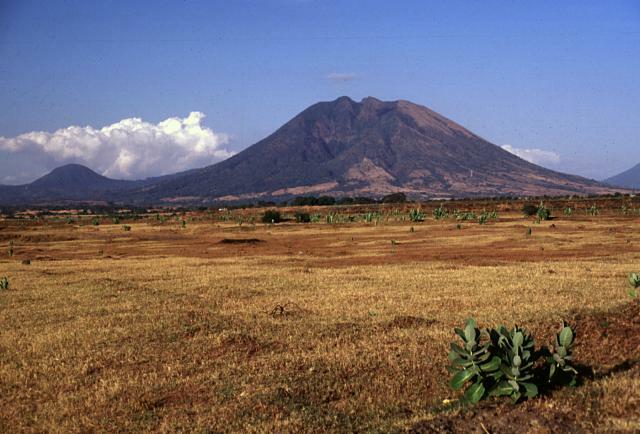 If this volcano has had large eruptions (VEI >= 4) prior to 10,000 years ago, information might be found on the Usulután page in the LaMEVE (Large Magnitude Explosive Volcanic Eruptions) database, a part of the Volcano Global Risk Identification and Analysis Project (VOGRIPA). There is no Deformation History data available for Usulután. There is no Emissions History data available for Usulután. 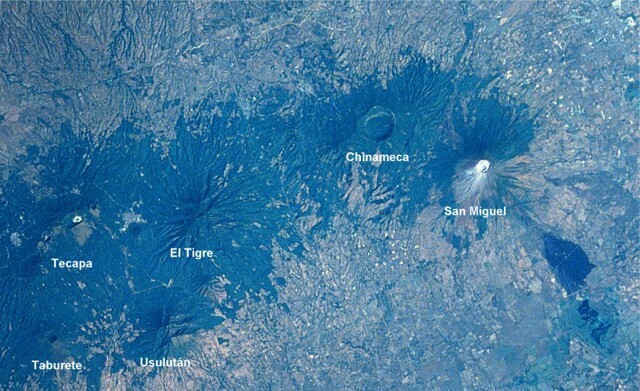 Usulután volcano (right), at the SE end of a cluster of stratovolcanoes west of San Miguel volcano, has an eroded summit crater, but youthful flows are present on its southern flanks. La Manita (left) a small cone to the NE of Usulután on the flank of El Tigre volcano has also been mapped as Holocene in age, along with Cerro Nanzal, a pyroclastic cone on the SE flank of Usulután. No historical eruptions are known from Usulután. A large erosional valley 1.3 km wide at its head cuts the eastern flank of the basaltic to basaltic-andesite Usulután volcano. It is seen here from the flanks of Chinameca volcano to its NE with the Pacific Ocean in the distance at the left. 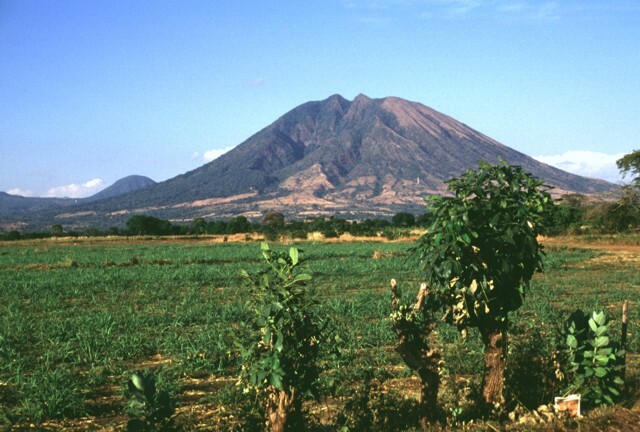 Despite its prominence, Usulután volcano has not been studied in detail. Four peaks of the 40-km-long Sierra Tecapa range rise to the NE above the Pacific coastal plain. On the left is Volcán Taburete, and in the center is El Tigre volcano. 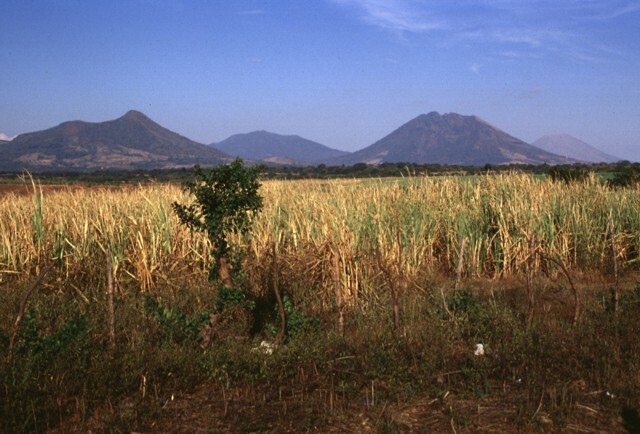 The high peak at the right is Usulután, and in the distance at the far right is San Miguel volcano, the highest in eastern El Salvador. Usulután volcano rises above the Pacific coastal plain at the SE end of a cluster of stratovolcanoes between San Vicente and San Miguel volcanoes. 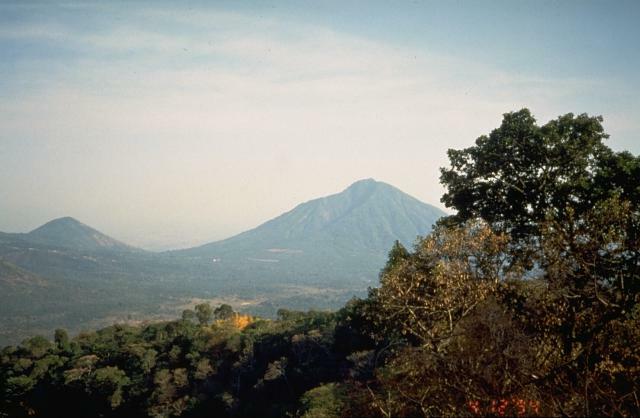 The forested Usulután volcano is mostly dissected, but youthful lava flows are present on its southern flanks, and the volcano was mapped in part as Holocene in age. Several large erosional craters cut the flanks of Usulután, including the valley seen in this view cutting the SW flank. The rounded peak at the left is the young cone of Cerro Oromontique on the margin of El Tigre volcano. 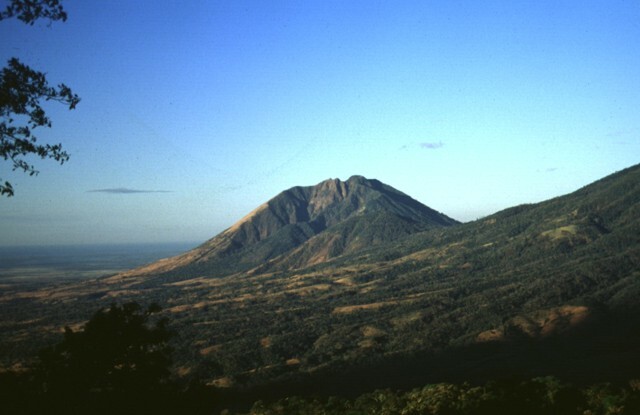 The rounded peak of Usulután is the 2nd highest of a cluster of volcanic peaks north of the Pacific coastal plain between San Vicente and San Miguel volcanoes. Usulután is seen here from the SSW with a large erosional valley cutting its flank. Cerro Oromontique, the small peak on the left horizon, was erupted along a fissure cutting the flank of El Tigre volcano. Relatively young lava flows are located on the southern flank of Usulután volcano. There are no samples for Usulután in the Smithsonian's NMNH Department of Mineral Sciences Rock and Ore collection. IRIS seismic stations/networks Incorporated Research Institutions for Seismology (IRIS) Data Services map showing the location of seismic stations from all available networks (permanent or temporary) within a radius of 0.18° (about 20 km at mid-latitudes) from the given location of Usulután. Users can customize a variety of filters and options in the left panel. Note that if there are no stations are known the map will default to show the entire world with a "No data matched request" error notice. Large Eruptions of Usulután Information about large Quaternary eruptions (VEI >= 4) is cataloged in the Large Magnitude Explosive Volcanic Eruptions (LaMEVE) database of the Volcano Global Risk Identification and Analysis Project (VOGRIPA).